HED has supplied analysis to some Bloomberg customers since 2010. As of May this year we also now supply the analysis and trading recommendations directly through the Bloomberg network of terminals on page <HEDR>GO for all Bloomberg subscribers. 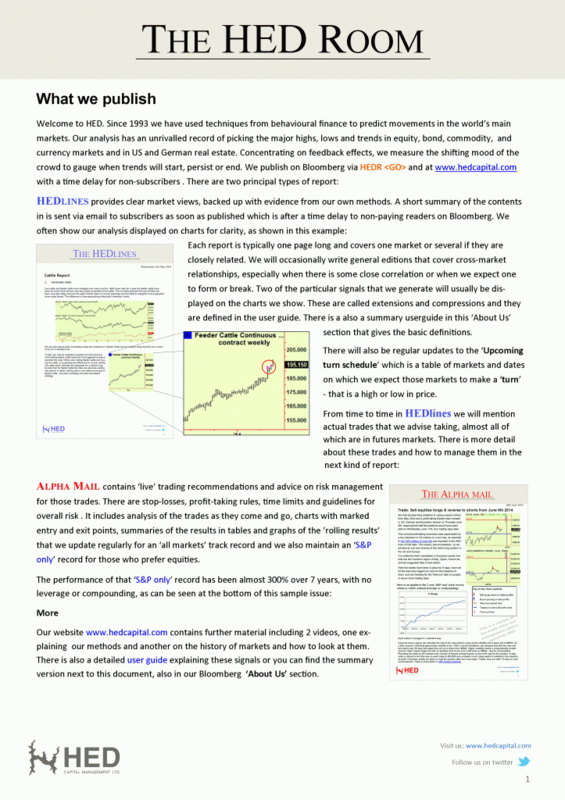 The page is called the HED Room and shares the general appearance of the two strands of our publications - HEDLines for analysis and commentary and AlphaMail for all trades and trade management. Publication of both the analysis and the trading advice on Bloomberg is delayed by around 48 hours to allow paying readers a continuing advantage - this is similar to the delay before new editions appear in the archive on our website.